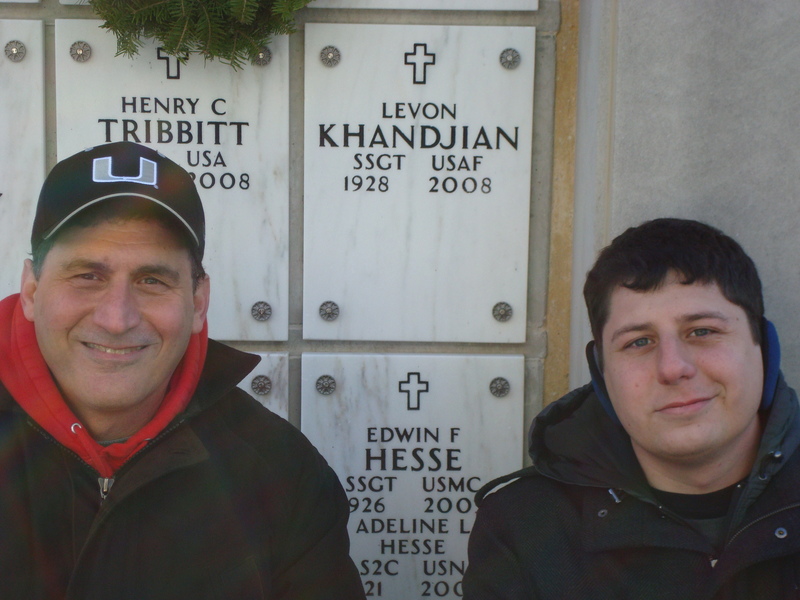 Because our son and his wife were in town for Christmas, Kevin and I decided to spend an afternoon at Arlington National Cemetery where we visited my Dad’s (and his Pa Pa’s) grave. It was his first time there and my first time back since we committed his ashes (the funeral in South Florida was months before the internment). As a pastor I bury people all the time – it is one of those privileges I cherish – to be entrusted with walking with a family through sorrow and lament is a sacred thing – Sharing in sadness is only part of the experience – as a pastor I am invited into life stories and hearts. But Dad is the first close family member I have ever lost. Oh, I have buried family members – aunts, uncles, etc – but no one so close. Yet there we were – at the grave of a man whose name both Kevin and I share. We not only share Dad’s last name, but we have his first name as well (our middle names are Lee). What we discovered that day was that for those who have loved ones buried at Arlington, they are granted a special status. We possess a pass that enables complete access throughout the entire cemetery, and therefore the right to bypass the crowds (the guards just wave you through!). You drive where others walk. You are given the sense that once a loved one is buried there, it is your cemetery – your property – an extension of who you are. That is the way we now feel when we go. Though it was bone-chillingly cold, it was also heart-warming. After taking pictures we talked about Dad – his life, his love for Jesus, his family and the Church – and we prayed – a time I suspect that neither of us will soon forget. In a sense that card not only granted us access to Dad’s grave, but once again to the story of the Gospel as well. The symbolism isn’t lost on me – through Dad’s death we have access to Arlington, and through Jesus’ we have access to the Father. The God who seemed so foreboding, distant and unapproachable before Jesus came, has been revealed as a Father who, through Christ Himself, joyously receives all who flee to Him in faith, as His daughters and sons. We have access – We “…approach the throne of grace with confidence, so that we may receive mercy and find grace to help us in our time of need” (Hebrews 4:16). Great story and symbolism. Sounds like you two had a time of getting more in touch with each other as you shared about your dad, and got closer to the Father together. And I hope to be able to catch moments like that with our boys when they’re Kevin’s age, too! God has inspired us as parents as well as His children through this post. Thanks! You are currently reading Access at unfinished1.